I bet he ain’t throwing a concert anytime soon. Even stopping a bank robbery only bring more contempt and distrust. This is making a further case for them to join Crimson Cowl’s Masters Of Evil, which pushes Jolt to her breaking point as she hates the very idea. Before they can consider further a group of kids from nearby Burton Canyon, whose town has been taken over by a gang calling themselves the Imperial States Of America, looking to turn the populace into superhuman soldiers to take over the country. The Thunderbolts manage to get into the town and discover the kids were telling the truth, including about their superhuman muscle calling himself Charcoal The Burning Man. They manage to chase off the Imperial States goons but Charcoal escapes when the Masters show up, not wanting the team to play hero while making their decision. They leave for another job and Jolt is worried the others might now join, but instead take offense and decide to pay them back instead. What they got right: Jolt is worried about the stolen car (good on Busiek to not simply let them have a car all of a sudden) and just keeps being awesome. She’s still my favorite Thunderbolt. They also realize they can’t rely solely on the cheerleading of a fifteen year old girl/Avengers fangirl and decide for themselves to help fight the Imperials when the three kids come to them for help. And Erik and Abe end up coming up with good plans, annoying Moonstone. Annoying Moonstone is always fun! What they got wrong: Songbird was one of my favorites as well. Then she gained more self-confidence and I was thrilled. Now she’s becoming more and more of a b#@%# and now I don’t like her. I wish Abe would just tell her off already. Other Notes: A little history. Charcoal was created as a villain as part of a Wizard Magazine contest. 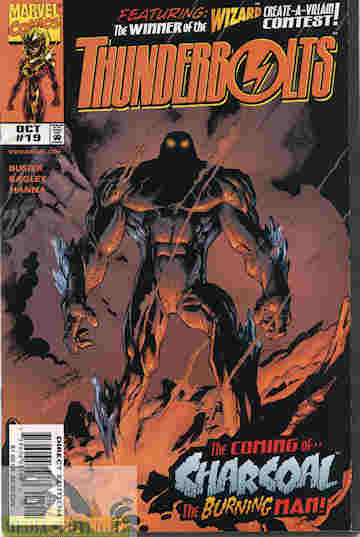 He is a villain until the next issue and while his alter-ego and backstory are Marvel created (specifically Busiek as the writer) the character himself was the creation of the Frosts. (I don’t know their relationship.) None of the other rewards they were supposed to get was ever given and when they protested Fabian Niceza was forced to kill him off by the guys upstairs. No wonder Marvel was suffering in the 1990s. (They have new reasons to suffer nowadays.) That’s kind of a jerk move by Marvel and by Wizard since they never followed through on their promises either. Recommendation: I’m still enjoying this version of the team (except Songbird less and less). You really should check this phase of the team out. Posted by ShadowWing Tronix on June 12, 2018 in Marvel Spotlight, Yesterday's Comics and tagged Charcoal The Burning Man, Imperial States Of America, Jolt, Mach-1, Marvel Comics, Marvel Universe, Songbird, Thunderbolts.